New Delhi: In a bid to infuse domain expertise in key government departments, the department of personnel and training has started the process of lateral hiring. In a newspaper advertisement issued on Sunday, the department invited applications from Indian nationals having expertise in sectors such as revenue, financial services, economic affairs, agriculture, infrastructure and commerce. The move is aimed at bringing in specialized talent in various government departments, contributing to better governance. State government officers in similar positions, officials in public sector undertakings, autonomous bodies, universities, research institutes and those working in private sector companies, consultancies and multinational firms with a minimum of 15 years experience are eligible to apply. This is a pilot project and has received the approval of the Union cabinet, a person familiar with the development said on condition of anonymity. 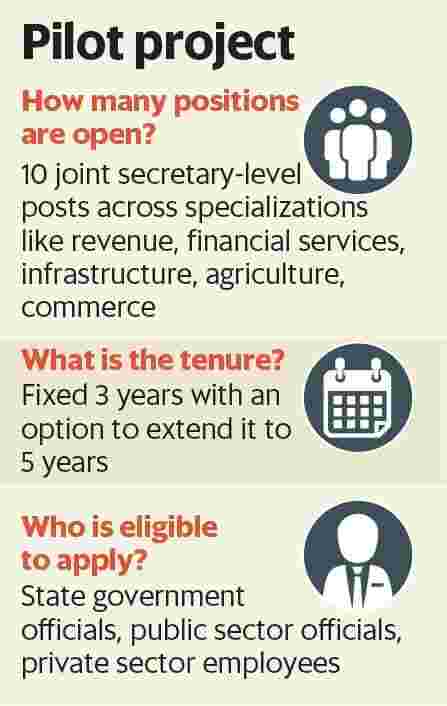 A total of 10 posts at the level of joint secretary are initially on offer. The period of contract will be three years from the date of joining and can be extended up to five years depending upon performance, the department of personal and training said. The last date for applications is 30 July. “Niti’s experience with lateral entry has been extremely good. They bring in a vast number of fresh and vibrant ideas. This move in Govt was long overdue and I welcome it. Will catalyse UPSC entrants to specialise. Govt must also allow deputation of its officers to private sector as well," tweeted Amitabh Kant, chief executive officer of Niti Aayog. Candidates should be at least 40 years old. Compensation and perks offered will be on a par with that offered to others at this designation.